3 bedroom, 3 1/2 bath, 3 level town home, 2 King Beds, 1 Queen Bed, sleeps 6. Governor's House is a luxuriously styled and fully equipped town home ideally suited to your vacation or business needs! Governor's House is located in the gated community of Vista Cay Resort and is just minutes away from Disney World, Universal Studios, Sea World and their brand new theme park Aquatica! Governor's House is also in walking distance to the Orlando Orange County Convention Center, the second largest in the country! Vista Cay Resort ranks # 1 in the Trip Advisor's popularity index for specialty lodging in Orlando! The Vista Cay Resort Clubhouse includes a fitness center, resort style pool with multi-level deck space, a children's play area, kids pool and Jacuzzi, spa, conference rooms, theatre, game room, and sports court among lavish surroundings. Beautifully paved walkways and paths border Lake Cay for guests to enjoy the Florida wildlife and vegetation that resides here at Vista Cay Resort! Governor's House boasts a generous near 1,800 sq. ft. of luxurious living space perfect for the Orlando business traveler or for couples and families vacationing in the alluring city of Orlando. However, it is the luxury touches that truly make this rental town home an elegant retreat. Enjoy custom window treatments with added sound and cooling insulation and custom paint throughout, plus modern conveniences like central heat/air, wireless access, phone, ironing board, and washer and dryer. Your own personal garage and driveway are also a convenient amenity here at Governor's House. Governor's House provides three levels of privacy, luxury, and comfort for your business or vacationing stay. On the first level is a beautifully custom furnished King Bedroom Suite complete with an elegantly appointed private bathroom, 32 in. Samsung Series 4 LCD HD TV, and French doors leading out to a patio. The second level boasts an open floor plan complete with a kitchen fit for a chef! From the Corian countertops to the modern appliances, you will find that cooking, eating, and entertaining a breeze. The kitchen also comes well equipped with a full refrigerator, stove, microwave, dishwasher, garbage disposal, and coffee maker. The bar is an added conversation enhancer! A beautiful dining table and chairs with an island theme backdrop and subtle lighting will ensure your elegant meal a total success! 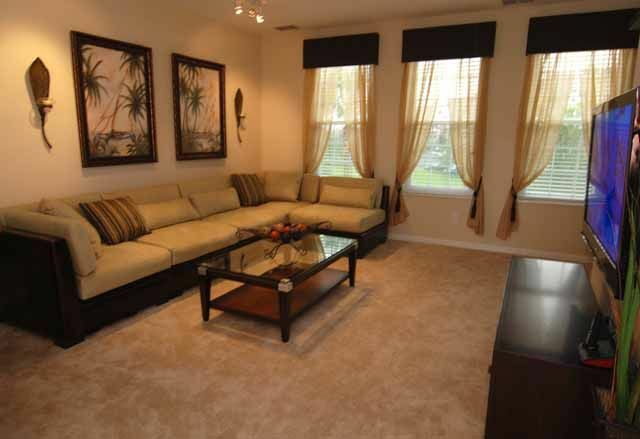 The spacious living room offers a designer sectional sofa set, beautiful artwork, and a 50 in. Samsung Plasma HD TV and DVD player. This is the perfect place to kick back and relax after a long day meeting with clients or after spending an exciting day enjoying the many various theme parks available to you. The third level offers a King Master Suite furnished in a tropical theme and an elegantly appointed custom Queen Suite. Each bedroom features bedding of distinction, full size closets, 32 in. Samsung Series 4 LCD HD TV's, and beautiful fully equipped bathrooms including wall mounted hairdryer, 500 TC linens and bath towels. Book Governor's House today for your group vacation, family gathering, or corporate retreat! It's available now! Please inquire about the other luxurious units that we have at Vista Cay. The condo was very nice and clean. Had plenty of room for family of 4. Really enjoyed having a bathroom connected to each bedroom. The location was great for going to the theme parks as it was a short and easy drive there. The pool area was also very nice. Lee was very responsive and great to work with. We had no issue our entire stay of 8 nights. We would definitely come back and stay at this condo. The property was clean and located near all major attractions. Also, all necessary things were provided such as pots/pans and towels. Thank you for your positive review of Governor’s House. This beautiful townhouse provides three large bedrooms with accompanying full baths, kitchen, dining, and large living room. It truly meets all your comfort needs whether business or pleasure. Thank you for choosing Vista Cay and we look forward to your future visits to Orlando. Clean, spacious, great location for Orange County Convention Center. Enjoyed staying at the Governor’s House. A short walk to the Convention Center. This condo was very clean, spacious, and affordable. Les answers every question immediately. Thank you for your positive review of your stay at Governor’s House. This town home offers two king and one queen bedrooms each with their own private full baths. Beautifully appointed living room and full kitchen. The perfect choice if your stay is fun at the close by parks or business at the convention center located across the street. Amenities are also next door. Thank you for choosing Vista Cay and we look forward to your next trip to Orlando. Kitchen and bathrooms were very clean. Bedding was clean and so comfortable! Location was perfect..close to all amusement parks, Publix, and Walgreens. Price was excellent. Communication with owner was excellent. This condo has two king bedroom suites and another queen room with bathroom! Perfect for what we needed. The only reason it’s not a five-star review is it needs a little spring cleaning..all artificial plants are coated with dust, base boards are dusty, light switches and doors need a good wipe down, carpet needs cleaning or replacing. Also, fellow renters be aware that this condo has three stories: first floor is king suite, second floor is living room and kitchen, and third floor is another king suite and the queen bedroom with bathroom. This configuration was perfectly fine for our party..two couples, each with a 10 yr old girls, but may not be good for elderly couples, those with disabilities, or toddlers not good with stairs. We would definitely stay at this property again if we were traveling to the area. Thank you for your positive review of Governor’s House. This townhouse is the perfect getaway whether business or pleasure for the family or colleagues. We always appreciate your feedback and we will address your specific concerns. We hope you again chose Vista Cay for your next visit to Orlando. We were so impressed with this property! We loved the spacious layout and amenities. It was very clean and well maintained. The kitchen was well equipped with lots of cooking utensils, pots, pans, and dishes. The beds were very comfortable and loved the decor throughout the property as well. Great location too; very close to a Publix and NYPD Pizza is awesome. Spent 8 days at the property and everything was "as advertised" . The townhouse has well furnished and clean, it was in a great location, and Lee was helpful. I would stay here again if I am back in Orlando. Thank you for your positive review of Governor’s House. Two king and one queen bedrooms each with their own full bath is perfect for business or pleasure. The town home is beautifully furnished including a full kitchen, living, and dining room. Centrally located just minutes from the parks, the convention center and amenities make it a popular choice for your stay in Orlando. We hope to see you on your next visit!